Brill Cleaner concentrate; "Englands' Best Cleaner" has been trading since '87. The base is a heavy duty degreasing agent that can be diluted to cover any cleaning job in households, businesses such as independent shop owners, dry cleaners, butchers, garages, commercial cleaning companies, workshops and industrial businesses. With an acid free, 100% biodegradable, bleach free base it can be used with the knowledge that it won't cause harm to yourself, materials or the nature. With Brill's versatility being one of its major selling points, it has proved to be very popular in a wide variety of British industries. Being able to dilute Brill to different strengths allows customers to use it on both light everyday cleans as well as heavy duty jobs and specialist cleans such as grease traps and car detailing. 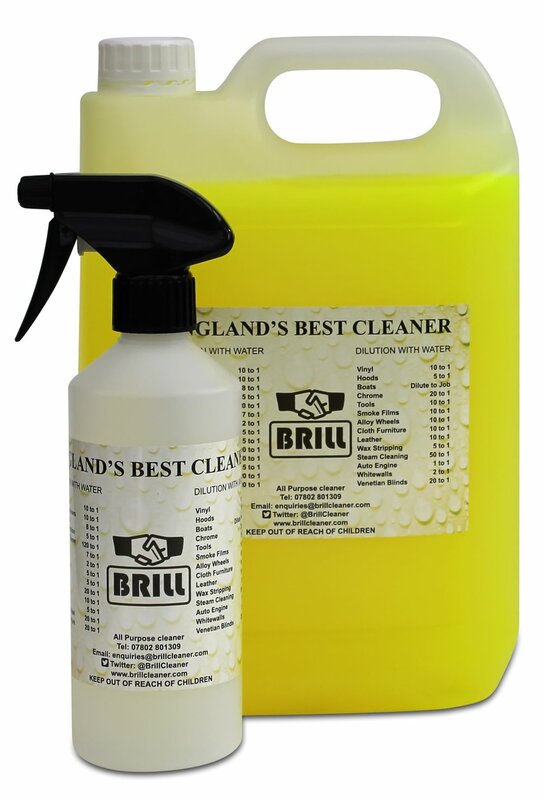 Brill Cleaner was established in 1987 by Vaughan Chambers, who set his mind on providing an high quality cleaning and degreasing agent at an economically viable price for small to medium sized enterprises.